일본 내에서 수년간 지속되고 있는 극단적인 헤이트 단체의 활동은 동영상 공유 플랫폼에서 쉽게 찾아 볼 수 있다. 이들의 배타적 태도는 오로지 자기 정체성을 확인하기 위해 자신의 주장을 도덕적으로 정당화하며 모든 수단을 동원하여 자기를 지키기만 한다. 하지만 우리는 이들을 단지 적으로만 대해야 할까? 혹은 그동안 사회 속에서 자신의 존재를 확인할 길이 없었으며 사회와 긴밀히 연결될 수 없었던 사람들의 왜곡된 사회적 분출로써 단지 동정해야 할까? 당장 해답을 찾기는 어려운 일이지만 어찌됐든 현재 당면한 사회는 어느 누군가가 아닌 우리 모두가 함께 만든 사회라는 것은 분명하다. TOLOVERUIN에서는 헤이트 시위대와 그에 대한 카운터 시위대가 서로에 대한 적대를 표출하며 걸었던 교토 도심을 움직임-공간 측정센서인 키넥트(Kinect)와 연인들의 카메라를 통해 재촬영한다. 미디어 확산 활동을 위해 각자의 대열에서 집요하게 상대를 기록했던 그 거리는 상대방만을 맹목적으로 바라보면서도 계속해서 흔들리는 연인들의 영상으로 대체된다. 연인들의 평범한 일상의 말은 상대를 완전히 이해할 수 없기 때문에 오히려 빠져들게 되는 매혹, 그와 동시에 찾아오는 감정적 소모, 서로 상처입고 상처입히는 분투와 끝없는 부침을 토로한다. 하지만 촘촘한 신체측정 센서망 안에서도 연인들의 입맞춤은 지속된다. 허약하게 조합되어 유포된 주장에 감정적 동지가 된 사람들, 그리고 그에 대항하여 “돌아가라”는 외침을 거울처럼 피드백하는 사람들을 연인들은 잘게 찢고 튕겨낸다. 말과 말이 부딪히는 자리, 혀와 혀가 섞이는 자리, 의심과 의문, 불안이 있는 그 자리에서 모든 관계는 다시 시작될 수 있다. 그것이 어떤 상처를 남긴다 하더라도 눈에는 눈, 이에는 이가 아니라 지속적인 비판과 설득, 이해의 과정으로 우리는 과감하게 뛰어들 수 있다. 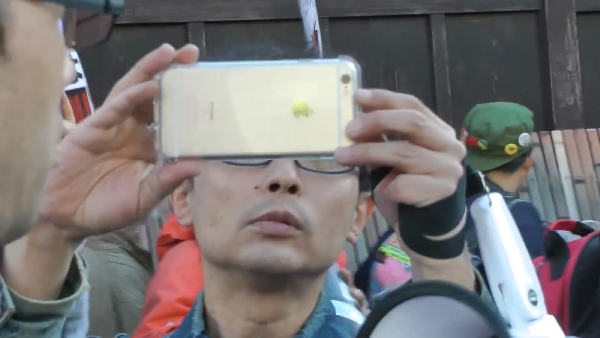 HD video with sound, 11' 30"
The activities of extreme “hate” groups in Japan, which have been continuing over several years, can easily be seen on the video sharing platform in the internet. Their exclusivist attitude involves attempts at morally justifying their opinions to strengthen their own identity and is focused solely on self-protection. However, should we treat them only as the enemy? Or, should we pity them as those who haven’t been able to find their place in the society, who haven’t been able to connect to the society and who are just venting their distorted anger? It’s hard to find a quick answer, but one thing is clear—the current status of society is not created by someone in particular; all of us shaped this, together. 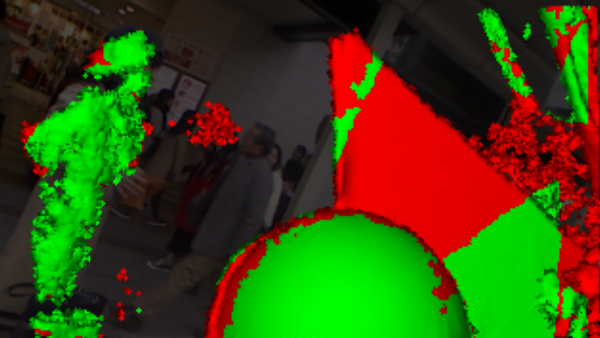 In TOLOVERUIN, the movement-space sensor Kinect and cameras held in lovers’ hands re-capture the streets of downtown Kyoto while protestors on the “hate” and the “anti-hate” sides march and express hostility towards the other side. The sceneries of these streets, where both groups tenaciously filmed each other for media-propagation purposes, are replaced with videos of lovers whose gazes are “blindedly” fixed at each other even while they can’t stop feeling anxious at all. The common, everyday words of the lovers reveals their fascination, which comes from the very fact that they can never understand each other completely, their emotional attrition that comes with the fascination, their struggles, and the endless ups and downs. However, the lovers’ kiss continues, even under the dense network of body tracking sensors. They shred into pieces and repel those who have became emotional sympathizers of unwieldily synthesized claims as well as those who confront them by returning the “go back” chant like a mirror.